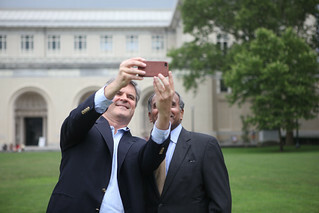 In late June of 2014, Steve Case, the Revolution team, and partners wrapped up the first Rise of the Rest bus tour after visiting Pittsburgh, Detroit, Cincinnati, and Nashville. Three thousand miles, $1.5 million of investments in startups across 14 cities, meetings with hundreds of entrepreneurs, participation from numerous public officials including Governors Terry McAuliffe in Virginia and Nikki Haley in South Carolina, U.S. Commerce Secretary Penny Pritzker, Senators Amy Klobuchar and Mark Warner, plus a few late-night stops for beef jerky and fuel later, and we’re ready to report back on how things are going in those first four cities, and share other highlights from these last 12 months. But first, why does Steve and the team cram onto a bus, sleep four or five hours each night, and roll through cities you wouldn’t typically think of as VC hotspots? In our view this is the dawn of a new day for startups across the U.S.: technology – and its ubiquity – has made it easier to launch and scale companies, improvements in public policy are making it easier to raise capital (but that remains a challenge), and there is a new understanding among public officials that the key to economic growth is ensuring entrepreneurs have the tools – and space – to innovate. The Revolution team believes we can find talented entrepreneurs who are building disruptive businesses anywhere, not just in Silicon Valley, Boston, and New York City. And we want to tell this story. Below are some milestones on the progress made in the initial four cities since the Rise of the Rest bus rolled through town. The Motor City is in the process of rebuilding and reimagining a future as dominant as its innovative past – through tech startups. One of those startups is Stik, the Rise of the Rest winner that took home $100,000. The launch of Stik’s self-service local business product, which automatically creates a fully formed display ad for merchants, has been used by more than 2,000 local firms since October. While the bus rolled through Detroit, Steve and Donn Davis, at the urging of Ted Leonsis, met with the leaders of Shinola, an amazing brand that is training Detroit-area workers to make things in Detroit – with passion and excitement – and sell them around the world. Months later, Revolution Growth invested in Shinola, and we’re thrilled to be part of the amazing company. More broadly there are reasons to be optimistic again about Detroit’s startup ecosystem: Techstars announced TechStars mobility that gives ten companies $120k in funding and three months of engagement with an extensive network. Rocket Fiber launched to provide faster internet across the city. Even though Frameri in Cincinnati, the Rise of the Rest company that won our $100,000 pitch competition, decided against taking the deal they were offered on ABC’s Shark Tank, sales have jumped over 10x since last quarter, the state of Ohio approved a $750,000 loan, they’ve shipped glasses to 30 countries, and hired a former executive from Luxottica and Coastal.com to be COO. Next up is a move into retail. Interested in buying a pair? Part of these bus tours is about helping to connect critical components – especially talent – of a city’s startup ecosystem which is what happened when Wendy Lea, a Silicon Valley veteran, relocated to Cincinnati to run Cintrifuse after a connection she made during the Rise of the Rest visit to the city. One of the Rise of the Rest winners in Nashville, Artiphon, has broken a few records: the digital musical instrument raised over $1.3m in kickstarter money from people in 70 countries. That represents the most money ever raised during a crowdfunded musical instrument campaign by 3x, and one of the top kickstarter campaigns in history. Dr. Butera is building something special in Nashville and hardware is only the beginning. Meanwhile the Nashville Entrepreneur Center continues to be a central hub of startup activity for the city: the EC launched its first iteration of Project Music, the first tech accelerated dedicated to the future of the music business, that graduated 8 companies in May that have raised more than $2.2m. In addition to providing new opportunities for the cities’ entrepreneurs, the EC team has also visited 15 other markets while hosting visitors from 20 other markets all in an effort to benchmark best practices in the startup development space. In Pittsburgh, we not only met with legendary Steeler Franco Harris, but SolePower won the $100,000 Rise of the Rest investment. The company recently had their first product deliver to the U.S. Army with a second military contract now secured. SolePower’s consumer product is in beta trials and will be launching later this year. Another Pittsburgh company that pitched during the visit, Identified Technologies, recently closed a $2m seed round led by Birchmere Ventures. That raise, along with SolePower’s growth, is part of Steeltown’s startup success in 2014: more investment went into Pittsburgh tech companies than any year since 2001. Compared to the nation’s 40 largest metro areas, Pittsburgh ranked 11th in VC investment dollars per capita and 5th in deals per million residents. Bidr, the Charleston Rise of the Rest winner which makes it easier for event organizers to raise funds, stepped up and helped raise money in the wake of the tragedy at the city’s Emanuel African Methodist Church. WealthForge, the Richmond winner, just surpassed $1 billion of Regulation D 506 private placement offerings submitted and received through the company’s processing platform. SoLoMo, in Madison, raised an additional $1m in their Series A round and received matching funds from the Wisconsin Economic Development Corporation. The company also rolled out their newest version of the “Smart Location Platform” which brings marketing cloud to life in a physical location. In Atlanta, Partpic – which won the Rise of the Rest pitch competition and went on to win another competition in Nashville – recently closed a $1.5m round. In the wake of Hurricane Katrina, many mission-oriented Teach for America alumni have stayed in or relocated to the Big Easy to start companies especially around EdTech. We met with a few including Jen Medbery’s startup, Kickboard, which is enabling teachers to make better decisions for their students. If you haven’t seen what’s happening in the New Orleans startup ecosystem recently (including with the Rise of the Rest winner, GoToMeeting) it’s worth taking a trip. Speaking of EdTech, Pear Deck based in Iowa City, took home $250,000 in multiple Rise of the Rest pitch competitions. The company is growing in Iowa and allowing teachers nationwide to plan real-time lessons for their students. Our next Rise of the Rest tour will be taking place in late September and early October. Details to come soon! In the meantime check out our latest video recapping the third Rise of the Rest trip.